A successful event marketing campaign will help qualified leads discover your brand – weeks before the event. Image by Stéfan via Flickr. Participating in live events gives you the opportunity to network, learn about industry trends, find partners and develop relationships with customers – all while getting some fresh air away from your computer screen. But what many people fail to understand when planning to participate in these events is that they need to be treated as campaigns. If you’re dropping lots of money on plane tickets, booths and swag, you need to be able to report that it was all worthwhile. And without an action plan, you won’t see a return on your investment. So how can you be sure that your marketing dollars don’t go to waste and that you identify new prospects and convert them into new leads (even before the event takes place)? All it takes is a small advertising budget, clear objectives and a couple of dedicated landing pages. Before you create any landing pages or straighten out your advertising budget, you need to first get clear on the objectives of your event marketing campaign. Do you want to spread the word about your brand? Collect more leads? Nurture your relationship with current customers? Establish yourself as a thought leader in your space? 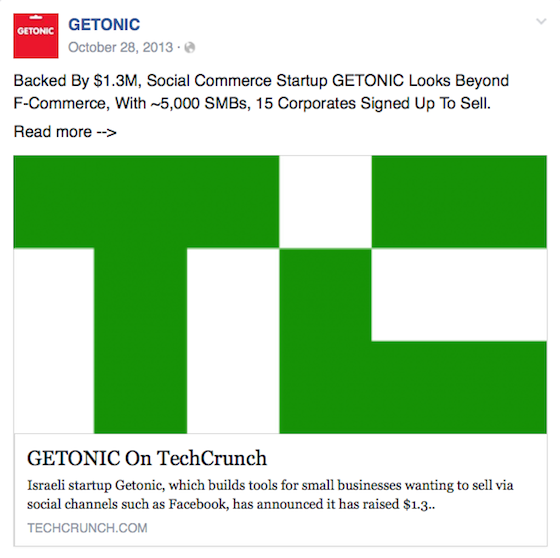 When our client, social eCommerce startup GETONIC set out to participate in two major internet conferences, they wanted to be sure to stand out from other participating startups and receive attention from investors, journalists and biz dev professionals. In addition to this, they wanted to start developing meaningful relationships with prospects and begin to collect leads. Branding: To get more exposure for the brand before the events. Direct response: To collect leads in an interest list to schedule in-person meetings with prospects and to ensure the turnout of a speech by GETONIC’s CEO. Once you have your objectives, the next step is to decide on the appropriate audience to target – and how you’ll reach them. This could mean targeting past attendees, people who have “liked” the event on Facebook and people who bought early bird tickets. On Facebook, target users who appear on the list of participants/attendees on the events’ websites and Facebook events. Target users who “liked” the event pages on Facebook. On LinkedIn, target members of the events’ groups. Finally, using Google AdWords, remarket to visitors who click through to the GETONIC website and landing pages from the Facebook and LinkedIn ads. Any company participating in a conference or other live event does so with the goal of heightening brand awareness. And a good way to give prospects first (and repeated) exposure to your brand before the event is by creating effective targeted social ads. But how do you get your company to stand out amongst the hundreds of other presenters? For example, the ad above leveraged the social proof of being featured on TechCrunch and having received $1.3M in funding. If your prospects are clicking on your ads, odds are they’re interested in learning more – so make it easy for them to do so. 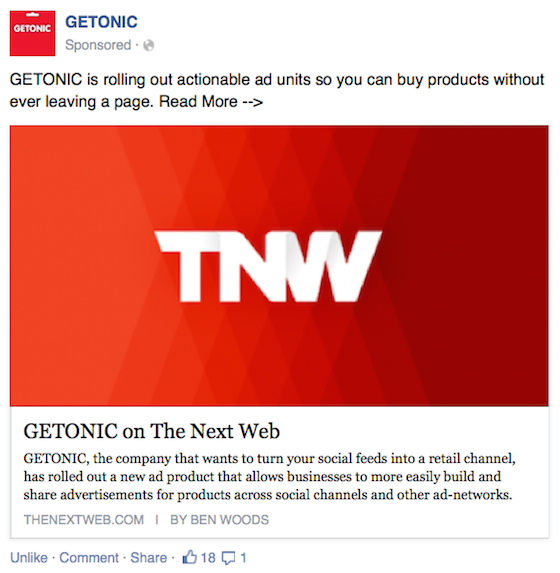 Prospects who clicked through to the GETONIC website from the third ad would then be shown various remarketing ads, giving them second and third exposure to the brand. Brand awareness is awesome, but it’s hard to track. If you’re running an event marketing campaign, you probably also want to see more tangible results – in the form of email addresses of leads who expressed interest in your brand. Collecting email addresses before the event can help you remind prospects to visit your booth, attend your talks and continue to interact with your brand in general. These were some of the ads and landing pages from the GETONIC campaign. To ensure a high conversion rate, each of the direct response ads led to a dedicated landing page with a straightforward opt in form and a concise call to action. 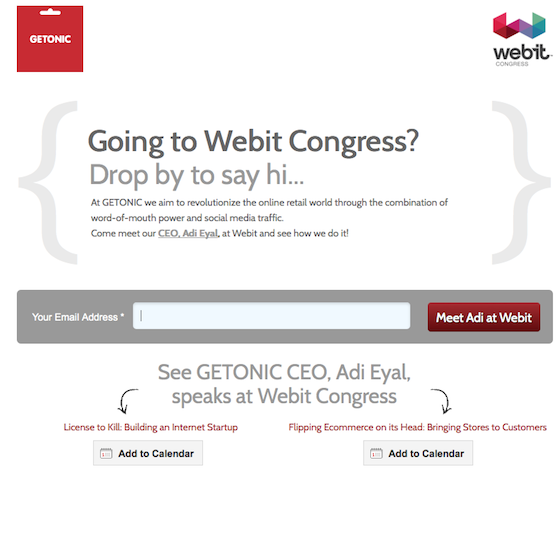 The Webit Congres Facebook ad above led to the landing page below. To help increase the attendance of CEO Adi Eyal’s presentation at the conference, the landing page included the AddThisEvent widget (above) to invite attendees to add the event to their calendars. Additionally, the Web Summit Facebook ad above led to the landing page below. 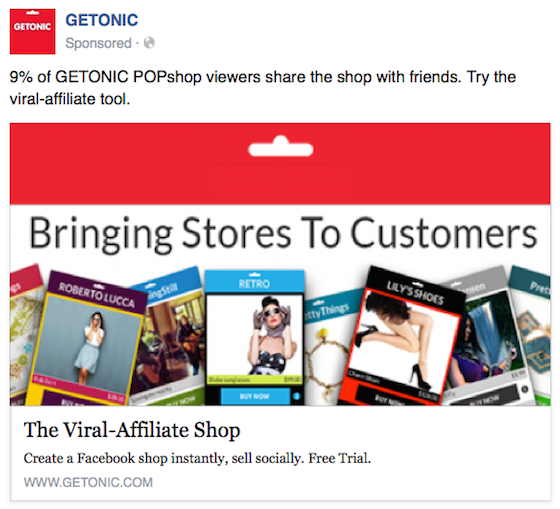 This landing page was meant to get visitors to stop by the GETONIC booth, leveraging social proof in the form of media reviews to further incentivize people to fill out the form to receive reminders. GETONIC generated 25 leads ahead of the event and followed up with them to schedule a meeting. And judging by Facebook branding ad clicks, over a thousand event attendees learned about the company. 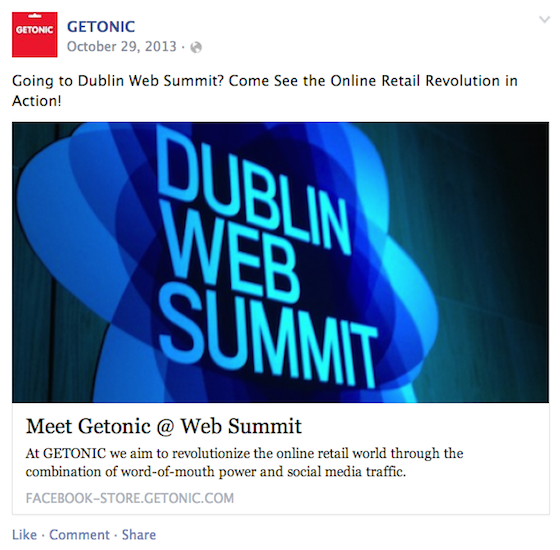 With a few days of planning, we heightened brand awareness and generated several interested leads for GETONIC before the events even took place. It’s no secret that the success of branding campaigns is less quantifiable than that of direct response campaigns. In our case, it was hard to know which of the thousands of people who visited the GETONIC booth did so as a result of the branding campaign. To get some idea of the effectiveness of your branding campaigns, consider using a campaign hashtag or simply asking leads how they were referred. Track the success of branding campaigns with campaign hashtags or by asking how leads were referred. If you’re just starting out, the vast majority of your target audience will not recognize your brand. That said, they’ve been exposed to the event’s branding (they registered for it, after all), so you want to leverage that. 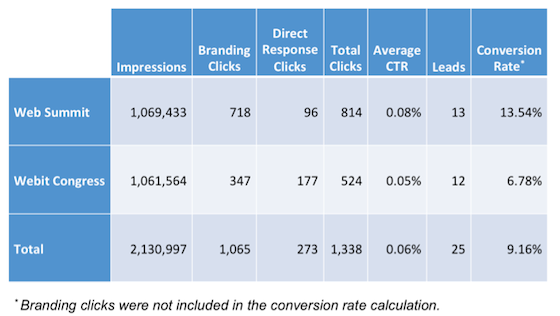 We found that the click-through rate in ads with the events’ logos was much higher than those with the GETONIC logo alone. 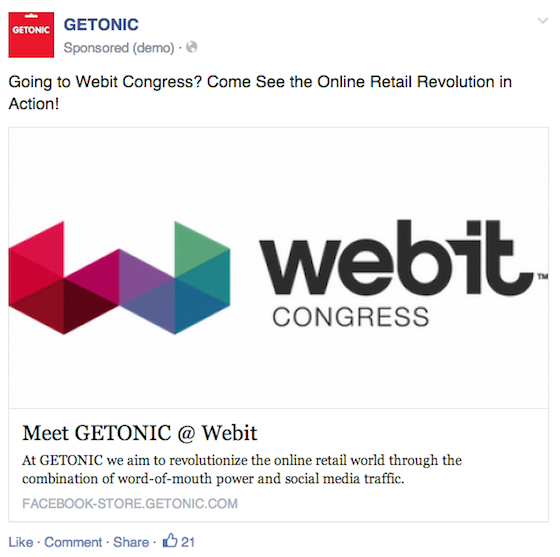 For example, in one of our Facebook campaigns, the CTR of an ad with the Webit logo was four times higher than that of an identical ad with the GETONIC logo (with a statistical confidence level of almost 100%). Media endorsements are nice to have on your landing page (assuming they’re positive). And when it comes to increasing the conversion rate of your event marketing campaigns, flaunting your mentions in the press and in leading blogs is a must. You’ve likely heard others sing the praises of social proof, but we saw its effects first-hand. The landing pages for each of the events were identical in layout other than the placement of the social proof. On the Web Summit landing page, media endorsements were placed above the fold, but appeared below the fold for the Webit landing page. With the social proof front and center, the Web Summit landing page’s conversion rate was 13.54% – almost double that of the Webit landing page (6.78%; confidence level of 93%). 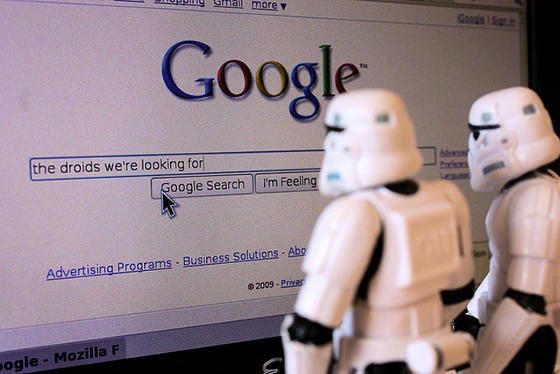 You should always test to see what appeals to your own audience, but when in doubt, don’t be shy to brag. If you put the time and effort into spreading the word about your participation in events, you may find that your hard work pays off in terms of collected leads and heightened brand awareness. By using targeted social ads, a small advertising budget and landing pages, even small event marketing campaigns can see great ROI. And though these campaigns are often limited in scope (limited to event registrants), this type of face-to-face lead nurturing can result in lifelong customers who make the investment worthwhile. Now it’s your turn. Have you run similar event marketing campaigns? Which strategies worked best for you? Gil is the co-founder of Jellop, a results-driven online advertising agency that uses innovative PPC strategies. Equipped with extensive experience working with startups and a true passion for creative targeting, Gil is Jellop’s Facebook Advertising Master. He utilizes his content editing background to write killer landing page copy.